I recently bought this new case made by Spire, model SP1071B. It was very cheap, only ~15 euros (clearance sale in a local shop). Didn't have time to install it until about a week ago. After getting everything inside and started using it for some time, I noticed this really strange static-like sound in the headphones. It seemed to happen every time there was hard-disk activity. If there was music on, the sound was almost unnoticeable, but when nothing was playing I could clearly hear it. The sound itself resembled coil whine or a floppy disk unit reading something. But this was nothing compared to the noise that was generated when copying files to / from USB sticks. Or the one made when using an USB Wi-Fi card. Oddly enough, with the old case everything worked fine, there was no interference at all, so I decided to investigate this a bit and find a fix. I opened up the front of the case and got out the PCB that hosts the USB and audio connectors. The circuit is really simple, just some connectors on a board, nothing more. Following the traces I could see that even if the audio and USB ports have their own wires for the ground, on the board they were connected, forming a common ground. At the time, nothing seemed out of place so I went and dismantled the old case and looked at its front panel PCB. It looked almost the same, with the exception that the ground wires were completely independent. I thought that it would be a good idea to do this on the new PCB as well, so I separated the circuits and lo and behold, the crackling noise is completely gone! To be sure nothing else could inject signals in the audio circuit (because long wires like the ones from headphones tend to work as antennas), I also passed the AAFP wire through a small ferrite ring harvested from a broken motherboard. 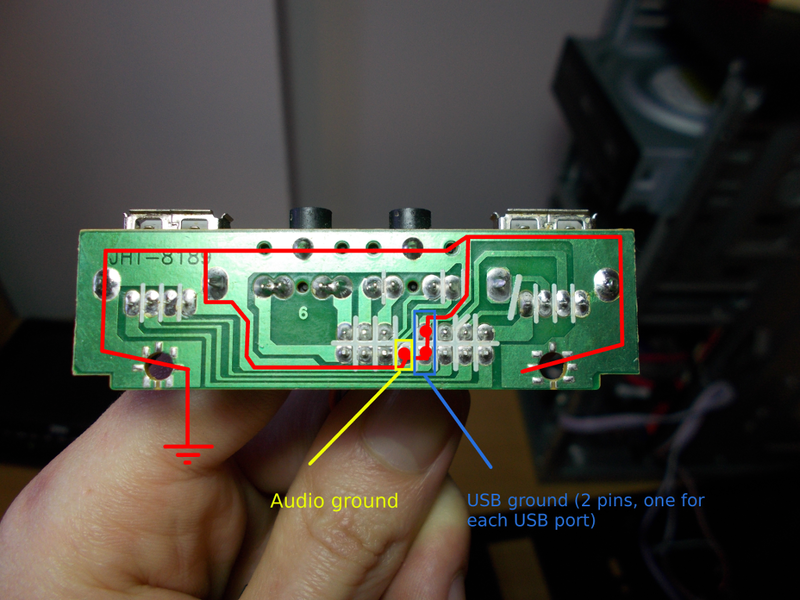 My guess is that somehow joining up the audio ground with the USB ground creates a ground loop, in which current from the USB port leaks in the audio circuitry creating the EMI. The generated noises seem to be correlated to the power drawn by the connected usb device. Later I found out that tying the grounds together is a very common practice among case manufacturers. Maybe we should send some e-mails to them showing the issue?